We whiled away the day once again at Sam Nail’s old homestead in Big Bend National Park. It was very windy day and we wanted a nice quiet place out of the breeze. The birds were once again plentiful there, one of the few places in the park we found many birds this trip. 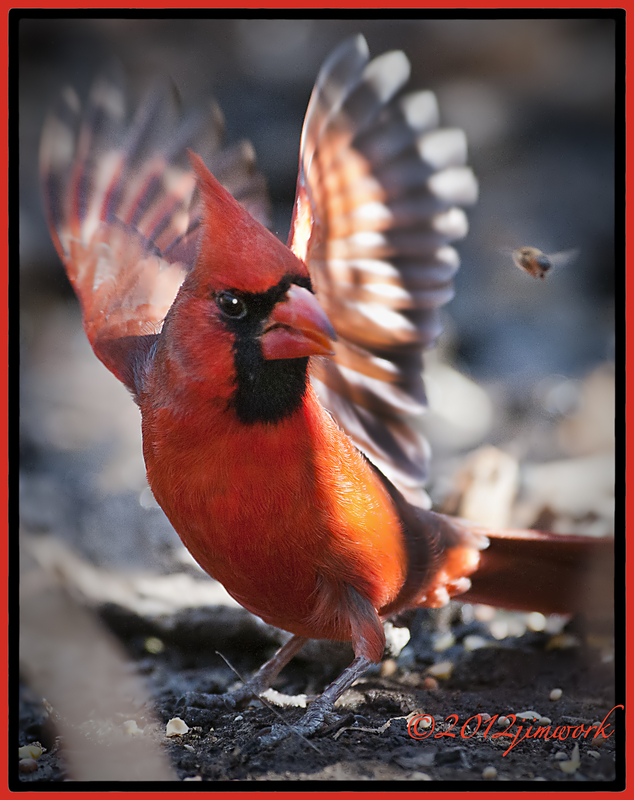 This Northern Cardinal (Cardinalis cardinalas) male was a handsome scarlet specimen. I was a little surprised when he like really freaked out when a bee invaded his drinking space. I started to share my insect repellant with him. But we are not supposed to interfere with the wildlife, plus the spray would have probably freaked him out too. That is an absolutely incredible shot… LOVE IT!!!! Nice capture! I love how you can actually see the emotion in the bird’s posture and eyes. Really nicely done. Wow! What a great capture! Wow, another stunner. What a great moment captured!